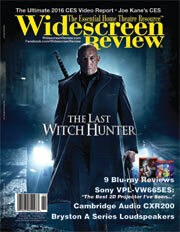 Reading Widescreen Review for the past four years has been a liberating experience for me. Issue after issue you continue to write the most intelligent, full depth, and logical reviews and you do not pull any punches. I've bought many of my home theatre items after reading about them in WSR, and I must say they perform exactly as you have written in your reviews. I'll be a customer for a long, long time. Thanks for a great magazine.